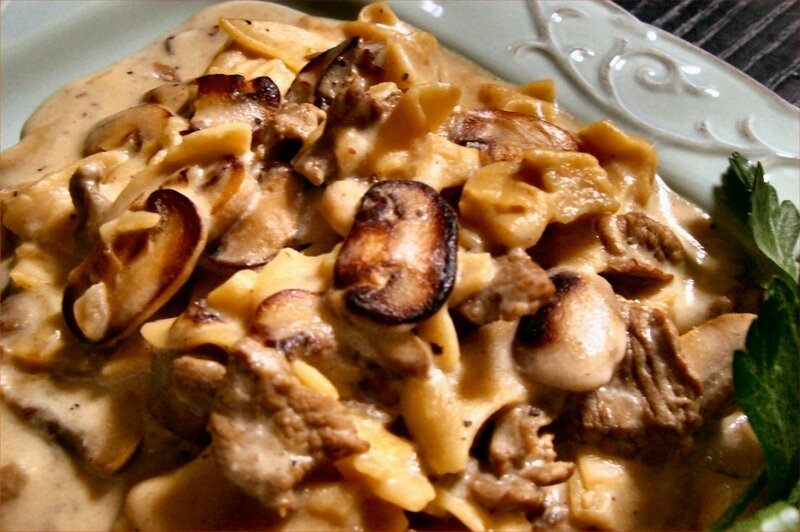 My mom’s creamy beef stroganoff has been a family favorite for more than 40 years. It’s delicious, quick and simple to make, and so good you’ll find yourself eating it cold right out of the fridge. It has some of my favorite foods – steak, mushrooms, pasta and sour cream. Now you can make it, too! In a large saucepan, cook egg noodles until al dente. While the noodles are cooking, prepare your sauce ingredients. In a nonstick skillet over high heat, melt the butter; add onions and mushrooms. Cook, stirring often, until the mushrooms are golden brown. Add garlic salt and beef bouillon granules and stir to combine. Add thinly sliced steak and toss just until steak is still medium-rare (it will continue to cook in the sauce later). In a bowl, combine sour cream, flour and nutmeg, stirring until well combined. Turn the heat under the skillet down to medium, and stir the sour cream mixture into the skillet until all ingredients are combined and the sauce is heated through; remove from heat. Don’t overcook here, or the beef will get rubbery and the sour cream will break down. Toss sauce into cooked, drained egg noodles and stir until well combined. Add salt and pepper to taste (and more nutmeg if you’re a fan). Sprinkle parsley over the top and serve warm. I like to serve this with warm, buttered deli rye bread and a nice green salad.